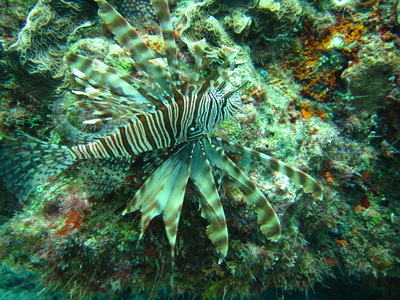 Lionfish are native to the waters of the South Pacific. Their accidental introduction in to Florida waters in the 1990’s is a grave threat to the coral ecosystems of the Caribbean Sea. Lionfish have no natural predators in the Caribbean and are prolific breeders. 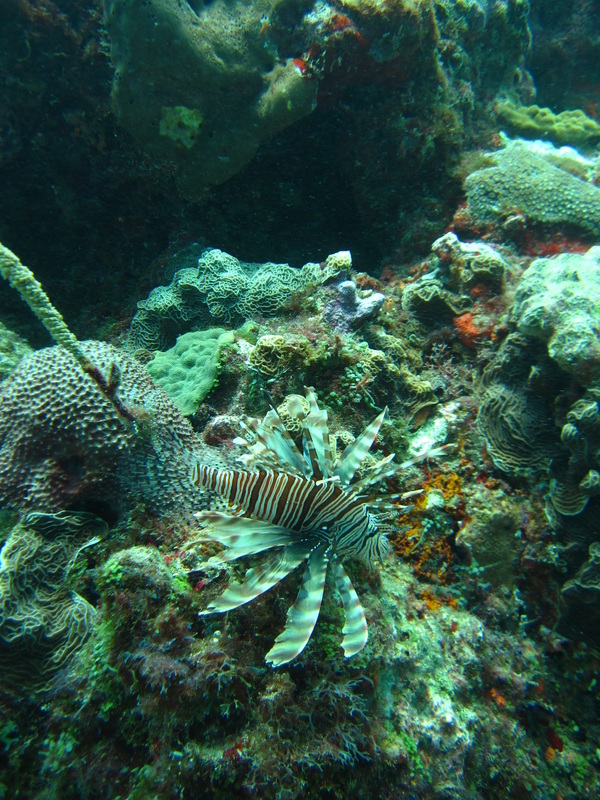 Their main food source is the small, colorful reef fish that feed on the algae that grows on coral. 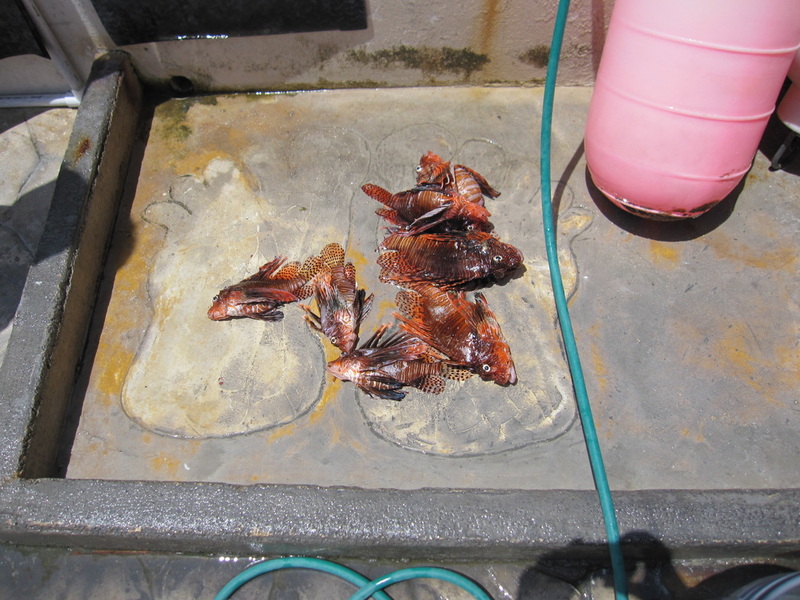 If the cleaner fish populations are reduced significantly the corals suffocate from the algae growth. 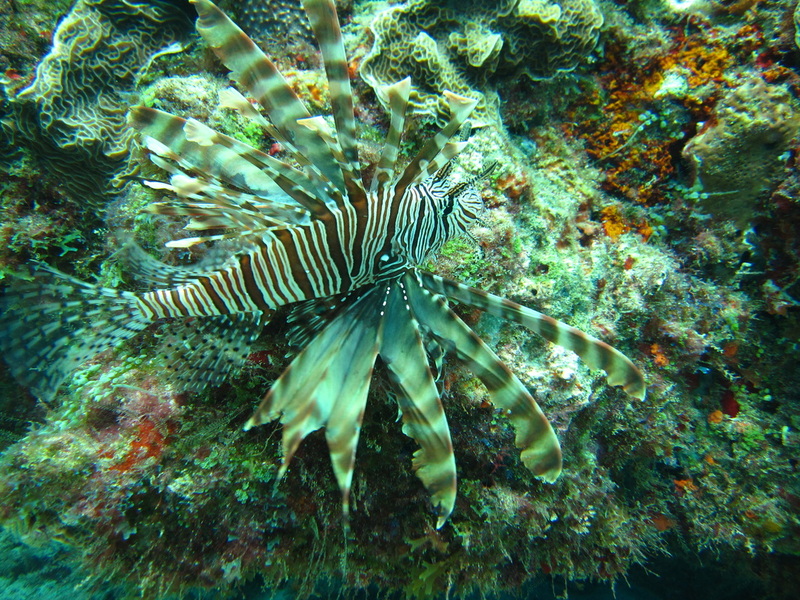 Lionfish also eat baby octopus, cleaner shrimp and small fry of larger species such as grouper and snapper. 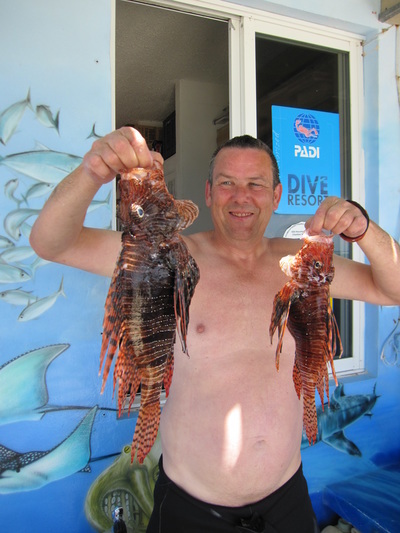 Aquanauts Dive Adventures has been hunting Lionfish off in Puerto Morelos ever since the invasion started in 2008. 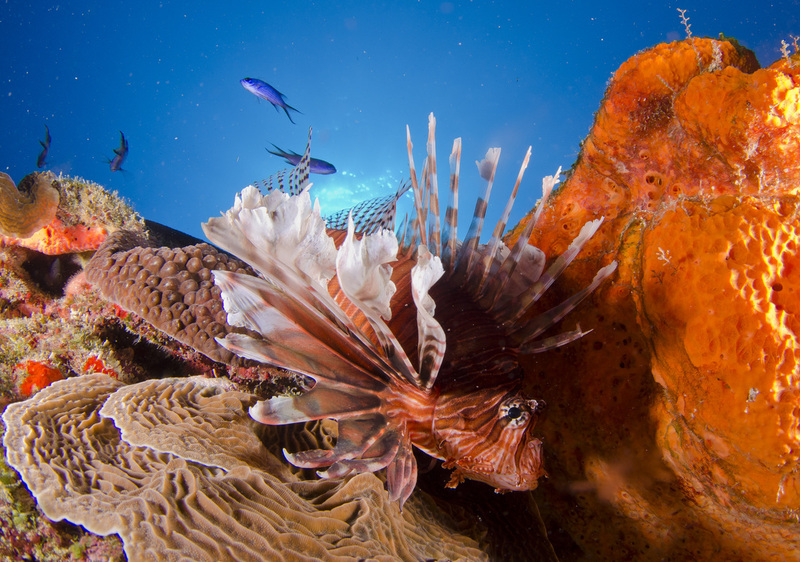 We invite experienced divers to join us in the task of keeping our reefs clean of Lionfish. We have custom made spears that are easy to use and control. 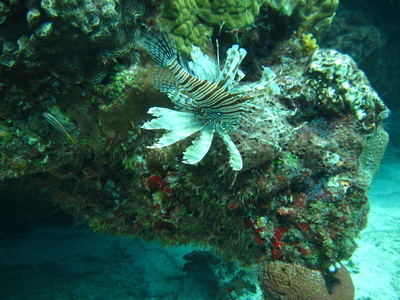 The Lionfish have poisonous spines and they do not flee from divers. Of course, divers must take great care to not get stung. 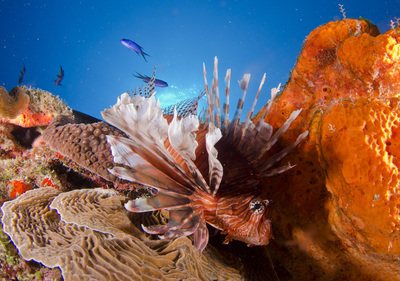 Lionfish venom is painful, very much like a bad bee sting. First aid treatment is immersion in very hot water. Hot water denatures the protein in the venom. 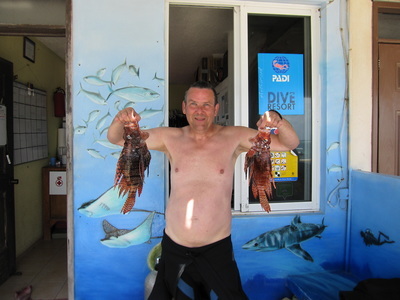 Lionfish flesh is very tasty and is especially good cooked in butter and garlic. After measuring and recording the stomach contents for local research, we will fillet your Lionfish catch so you can experience this delicacy. There are a number of restaurants we can recommend who would be happy to cook the fillet for you. The cooking process denatures the spine venom but if you make Lionfish ceviche (cooking with lime and no heat) you can expect your lips to tingle and get a little numb. If you have any questions regarding our Lionfish hunting tours, send us an email at contactus@aquanautsdiveadventures.com. 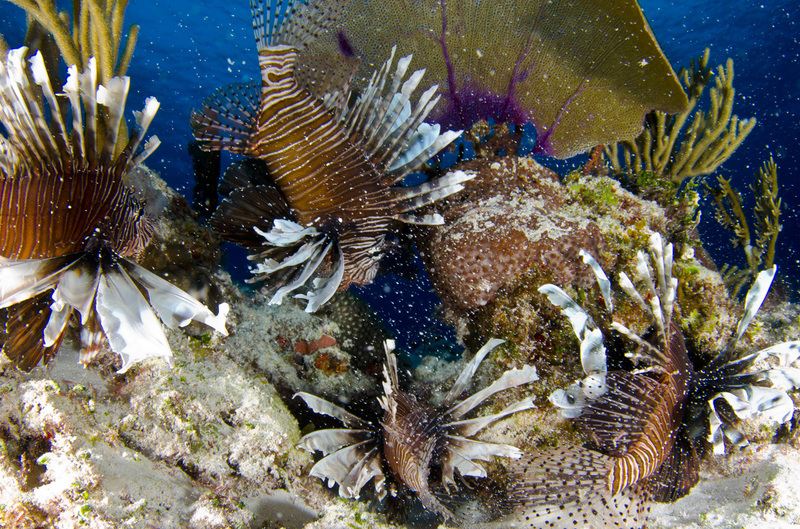 Follow the links below to learn more about Lionfish. Click HERE for USA Today article (pdf). Look at bottom right corner for article.